Dae-Sun Chung, the founder of Hyundai BS&C and the grandson of the founder of Hyundai Group, has now established Hdac technology which is ICOing with the aim of raising 6,000 BTC, currently worth nearly $60 million, to fund a new blockchain targeting the Internet of Things (IoT) market. They have already raised $100 million in a pre-sale, with the Hyundai connected project now undertaking a public ICO following delays caused due to compliance requirements with FINMA (Switzerland Financial Market Supervisory Authority) regulations. 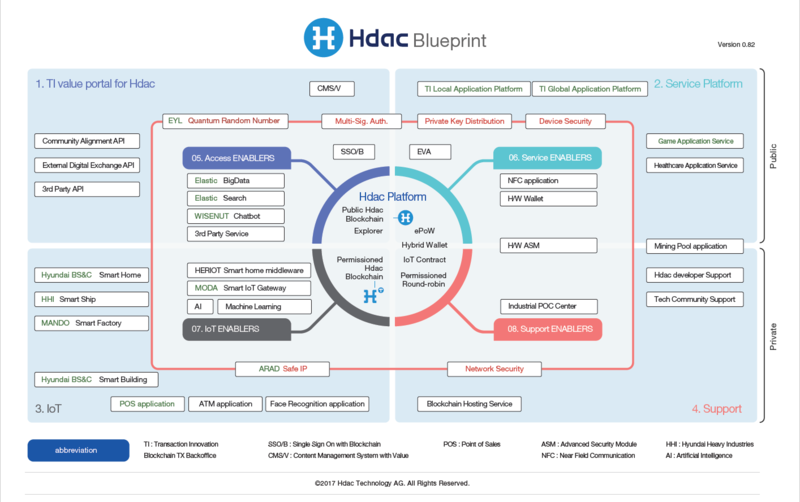 In a prospectus paper they say the Hdac platform provides authentication, mapping and machine to machine transactions for devices. “In the future, a large transaction processing blockchain may be a network of blockchains of a hierarchical or distributed structure composed of multiple private blockchains for each purpose. We will continue to research and work to implement this type of blockchain,” the project says. They further introduce a new ePoW algorithm, but do not provide much information about it except to say that it is permissioned. 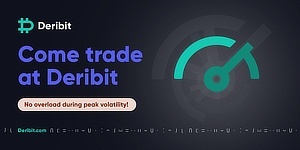 Their plan therefore seems to be a hybrid public-private blockchain, which is minable with block times, but it seems likely that miners would need to be authorized. 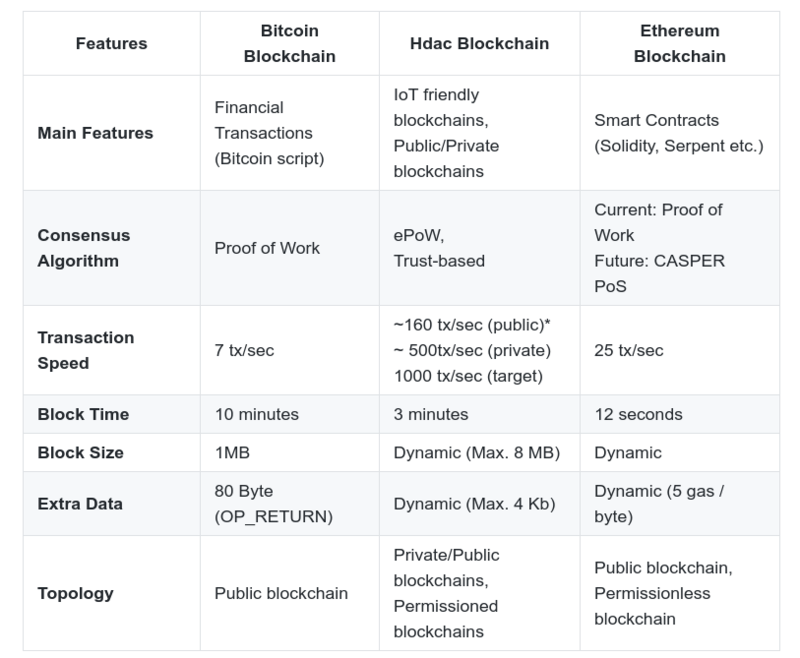 Bitcoin, Hdac and Ethereum compared by Hdac. “With more IoT devices hitting the market daily, our lives become more connected. Although there are many benefits to this, we open ourselves to great security risks. 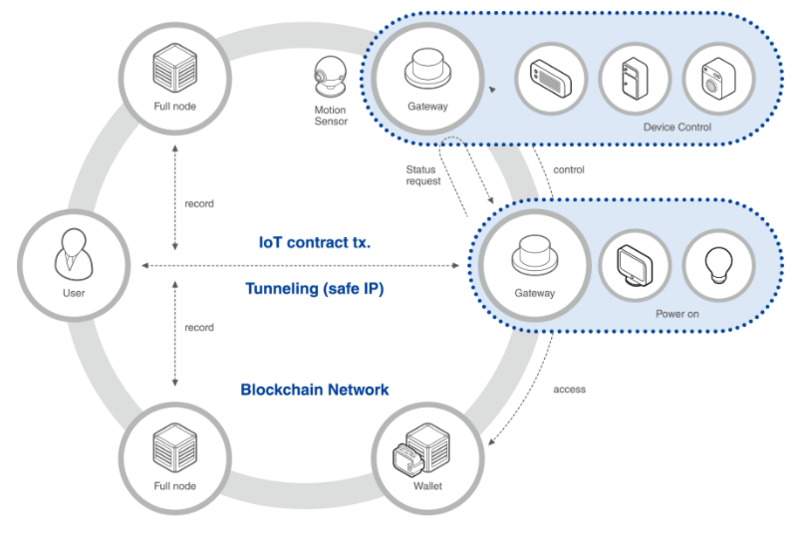 Blockchain technology, and special [sic] the Hdac blockchain, is the best way to leverage trust, transparency, and security on IoT,” Dae-Sun Chung says. The project seems interesting mainly because of its apparent connections to Hyundai, which means it may be incorporated in some of the motor giant’s aspects. However, it is not clear why a new blockchain is necessary, or what exactly this blockchain provides over other blockchains out there. Moreover, their website seems to be poorly designed at this time, and there are misspellings even in Chung’s quote above, suggesting lack of care or professionalism. Their github has no code on it at the time of writing, and their whitepaper is not quite a whitepaper but a prospectus. The project thus seems to lack any real substance at this stage. With it all seemingly relying on the Hyundai brand name, which we haven’t verified. Therefore can not be quite sure there is any connection with Hyundai or Chung. But IoT is an interesting market for the application of blockchain technology and the fairly advanced South Korea could place itself at the forefront as they might be able to appreciate better than most potential new tech gadgets. 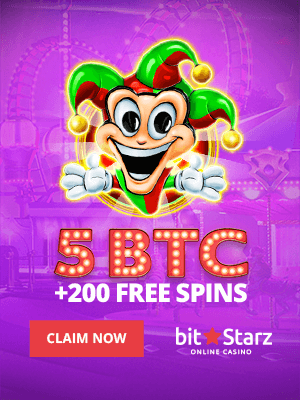 Therefore if the claimed facts are correct, it might be quite an interesting project to follow as blockchain tech and even ICO fund-raising methods begin to mature and enter somewhat more established markets.